We appreciate you visiting Deckstainhelp.com, your go-to source for the latest in deck restoration news and trending topics through 2019. If you are looking for honest deck stain ratings, look no further. In this updated article, we offer suggestions for how to best prepare and stain a new cedar deck. Feel free to leave a comment below. There are many different types of cedar used for exterior surfaces with Red Cedar being the most common. We recommend you wait 3+ months to stain new smooth cedar wood surfaces to allow the wood to weather, creating an ideal porous surface that will hold the stain better. (Always follow the stain brand’s directions, though). After the weathering, all new cedar wood should be cleaned and brightened for the prep. This will remove any oxidation and mill glaze. Many wood stains have difficulty penetrating new dense woods like cedar. If a stain does not penetrate the wood it will remain on the surface and become susceptible to peeling and flaking. The best wood stains for new cedar are deep penetrating paraffinic oil based stains that are thinner in viscosity. Stains for new cedar wood should dive deep into the wood to condition the wood cells and provide protection from UV fading and moisture damage. We like a couple of different stains for new cedar wood. One is Armstrong Clark Wood Stain. It is composed of both drying and non-drying oils that break apart from one another throughout the application process. The non-drying oils dive into the new cedar to condition the wood’s cellular structure while the separated drying oils cure on the exposed surface to not only lock in the conditioning oils but to protect the surface from natural weather exposure. Another similar stain best for new cedar wood is Timber Oil Brand. This is a paraffin oil-based wood and deck stain that penetrates deep into new cedar wood and decks. This cedar stain conditions the wood cells while providing water and UV protection. 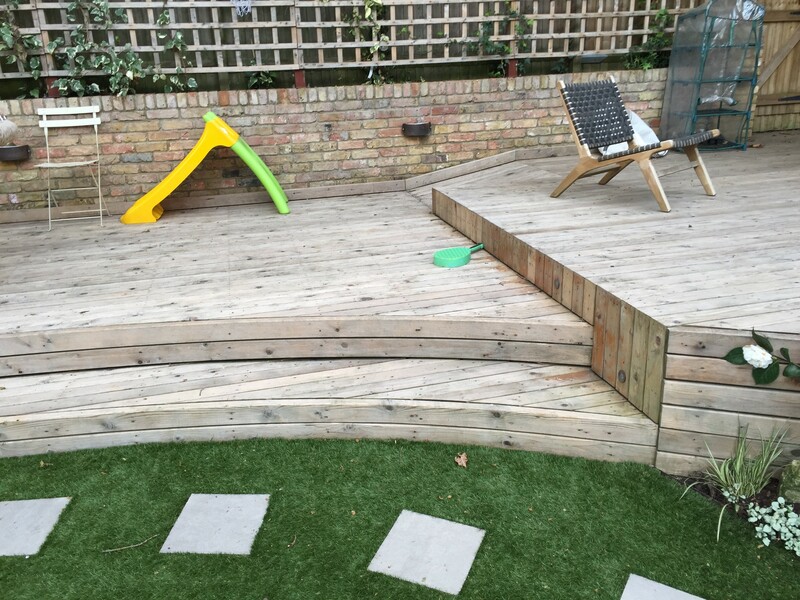 The Timber Oil brand promises ease of application of good penetration into new decking. Prepping new cedar wood is important to stain life and performance. New cedar wood should be cleaned using a sodium percarbonate wood cleaner to remove mill glaze and other contaminants that may have infiltrated the wood during construction. Once the new cedar wood has been cleaned the wood will appear darker. While the wood is still wet, apply a wood brightener to restore the cedar wood’s original color. Brightening wood after it has been cleaned will also open the wood pores to allow the conditioning oils to penetrate better. Proper cleaning and brightening will ensure the best stain for new cedar wood will perform as expected and provide lasting beauty. My question is about vertical cedar columns on my new house. I waited about 4 months before I applied 4 coats of polyurethane. They looked magnificent for about 1 month and then the southern exposed sides turned white. They look like plastic now. I expect to have to sand all of the poly off but what do you suggest I use to keep a natural color? 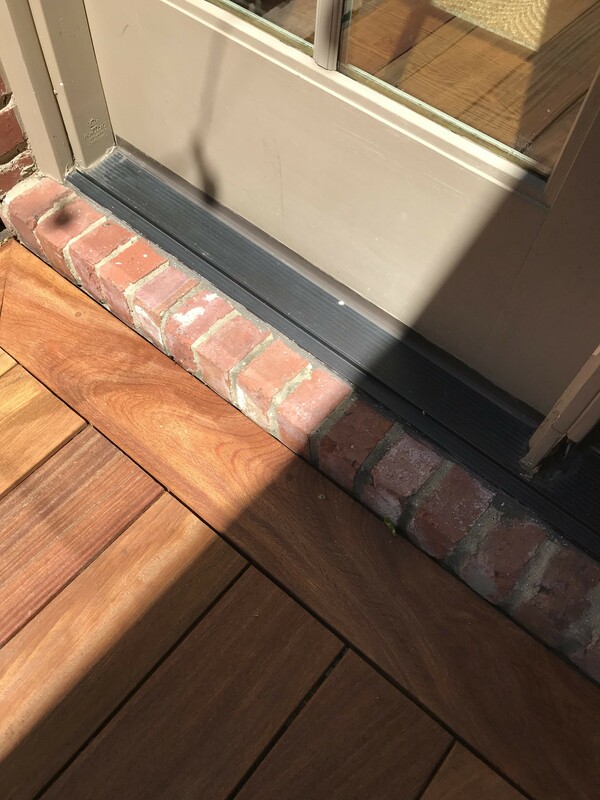 You cannot use a poly on outside wood. You need a penetrating stain semi-transparent stain. Look at Armstrong Clark or Restore A Deck Wood Stain. It’s cedar and was built 3 years ago. I’m never sure if it was sealed at the time but we have power cleaned it frequently. It feels like we’ve probably stripped most of the colour from it. I wondered if I should be both sealing it and staining it? – and if so would you advise any colour to try and restore the original cedar. You will need to clean again. Use a deck cleaner while pressure washing. Stain with a penetrating semi-transparent wood stain. No need to seal after. Do you think I should give it a quick sand before applying the stain? Installed a cumaru deck about 3 months ago. I have the finish work ongoing right now. Using Ipe Oil on the decking (it looks fabulous). The railings are cedar, and the post caps are mahogany (left from a previous deck). What is the best stain (brand, type and color) to use for a complementary stain color? I know it’s impossible to “match’ different woods, but would like a stain color that is close. 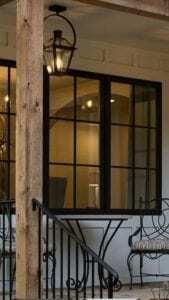 Also, I’ve seen recommendations for transparent and semi-transparent stain for railings. What is your recommendation and why? After staining, should any kind of finish protection be applied? Thank you! Try Armstrong Clark in Chestnut or Natural Oak colors. Semi-transparent will offer longer UV protection. 1) I can’t find a local dealer for AC in Nashville. I have located TWP which seems to also be a good choice for cedar. Do you have a color recommendation for TWP on cedar posts and railings to coordinate with Cumaru decking coated with IPE oil? c) wash, sand and re-coat now? 3) With Ipe oil, can you touch up or does each re-coating require wash, light sand and oil? 2. Leave as is for now. 3. You always have to prep when recoating. Use a deck cleaner. What would you advise using to get this color on our cedar columns? I want to try and take the red tint out but don’t want they grey either. 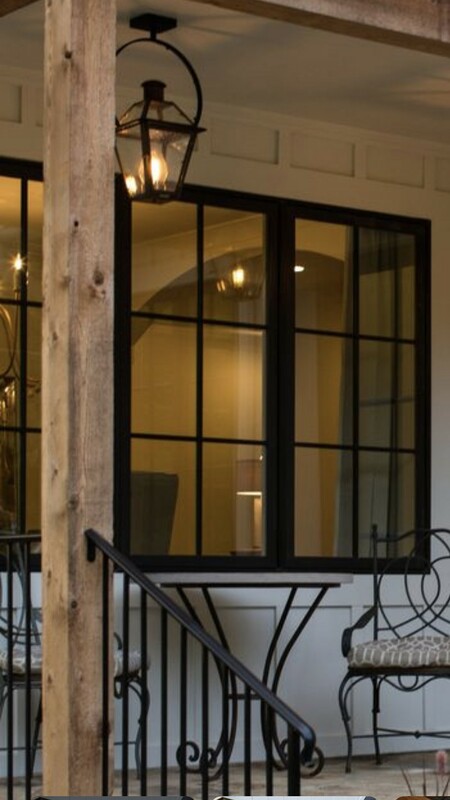 There is not a stain on those wood columns in the pictures. No stain means it will gray naturally in a matter of months. You cannot achieve that look and have UV protection. Adding a semi-transparent stain will achieve UV protection but will alter or enhance the color based on the tint you choose. We just put on a new deck 5/4″ cedar (untreated). I live in western wa. All the articles i read said to wait 3-4 months before sealing, but coming into the winter this makes me nervous. Should we wait until Spring to seal or stain? Yes, you should wait until Spring. Hello, I have boxed in laminated support beams in my finished basement with rough sawn red cedar. We control the humidity and it receives no direct sunlight. I would like to maintain its natural bright color and texture. Is there a product you would recommend that we should apply or should I not treat it at all? Any advice would be helpful. You want an interior coating, it is not the same as an exterior stain. Where can I buy Timber Oil Brand? I live in Seattle and just installed a new tight knot cedar deck. I have read so many opinions about treatment and stain and none of them seem to agree. 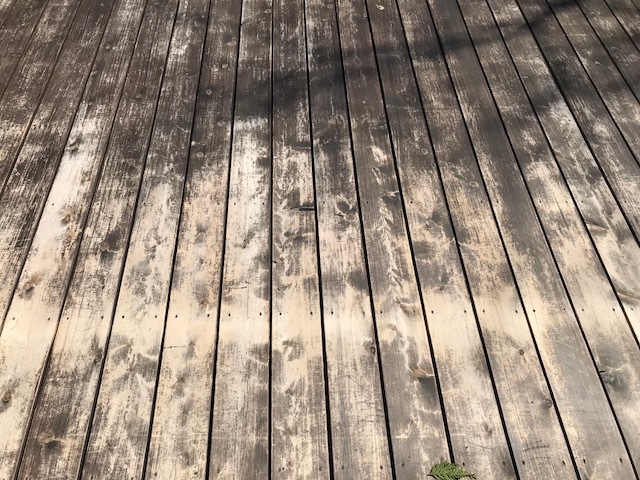 What products do you recommend to clean and treat the deck. Should I clean it and then wait a few months to treat? Help please!!! I also see that you have several product you recommend on the web site. I was wondering if there was a product that worked best in our wet Seattle weather taking into the account the tight knot cedar I used on the deck? TWP 100 Series or Restore A Deck Wood stains. I have a cedar swing about 6 years old. It sits in a corner of our yard where it’s covered by trees and doesn’t get much sun light. It turned green with mold or whatever. I cleaned it with a water bleach solution. Now it looks almost new again. How do I protect it from turning green again? Thank you. Try the Defy Extreme Stain or Defy Extreme Clear. I got some ‘bbq’ grease splashed on my bare cedar deck wood and am now getting ready to stain it. Is there a special way I have to clean those spots or do I just use the cleaner with sodium percarbonate in it? Grease will not come out with a deck cleaner if it is deep into the wood grain. Nothing we know of will get it out besides sanding. Hello! I am currently having a red cedar deck built. It will get a lot of direct sun exposure, and will be subjected to a lot of snow and very cold temps. Unfortunately we only get about 3-4 months of really good weather a year, and I am quickly running out of time for cleaning/staining, before we start to get into the cold wet weather. After reviews, I will be going with either an Armstrong Clark stain, or a Defy stain. Just wondering if you have a recommendation on which brand, or a particular line of their stains, might be best given my time constraints and the deck’s exposure, or if it really matters. The wood will have been dried before install, so should be a low enough moisture content to stain right away, or at least not long after. In this article you say stain right away for cedar, but then in all the comments you say wait months. Which is correct? Depends on the stain brand you choose and what they suggest. I am planning on putting in a port orford cedar deck. Can you recommend products that would work best to stain and seal this type of wood? I live in Centennial, Colorado. I had a friend recommend arborcoat but it seems like the reviews out there are mixed big time. Try the TWP 100 Series. One of the stains you recommend is timber oil brand, is that who makes it or just the kind of stain ? cabot makes one like that I see. No, not Cabot. Timber Oil Brand is made by Woodrich. I’m installing a new, kiln-dried, red cedar deck. My local hardware store carries Defy Deck Stain for Hardwoods, and Defy recommends it for cedar. Do you think it compares favorably with the Armstrong-Clark and Timber Oil recommended in this article? Thanks for your thoughts! Defy makes very good products. Use he Hardwood version for the new cedar. It will soak in better. I have an old deck out of western red cedar. I have removed all the boards because they used non-galvanized nails and I’ve decided to plane the boards down to 1-1/8″. Ideally I would like a clear coat or transluscent stain in order to keep the original colour of the wood rather than a solid stain. The deck is fully exposed to the elements. What is the best product to use for this application? I’m building a rough sawn white cedar patio and a white cedar picnic table with live edges. For the deck, what is the best option to maintain its natural color, keep from graying, and minimized maintenance? I did not plan on cleaning it as it. For the picnic table I’m really looking to maintain its natural beautiful grains and would like little maintenance and easy recoating. Thinking of a either a deep penetrating stain with sealer or some kind of stain with marine sealer or varnish over the top? Would you recommend a marine sealer/varnish? If so which ones are easy to recoat? Thanks! Great article. You cannot use a varnish on outside wood not can you top coat a stain with a sealer/coating, it will peel. What is a sodium percarbonate wood cleaner and how is it used? Are there any videos on how to do this? 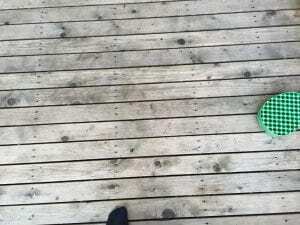 Restore A Deck and EFC-38 are both deck cleaners that contain sodium percarbonate. They have instructions on their websites. 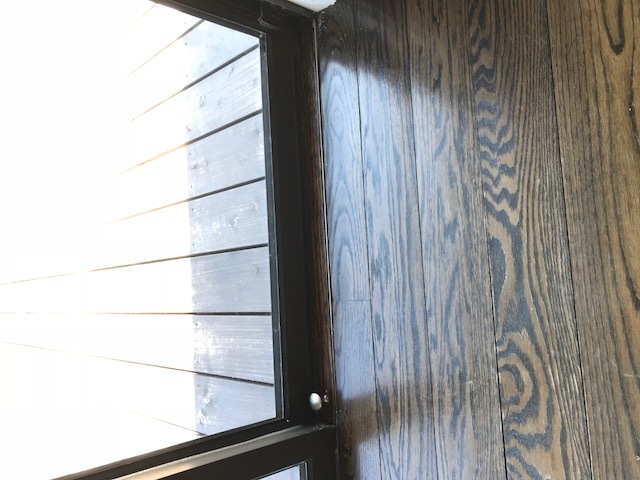 Why has Behr Penetrating Oil turned my cedar deck so dark? Becuase Behr makes bad products. With the oil version, it attracting dirt and mildew. Best to strip it off, brighten the wood, and stain with the TWP Wood Stain. I am replacing the cedar slats on my pergola and keeping the larger support beams. They are stained a dark color. What do you recommend for staining and sealing the new roofing boards (2 x 2s) so that it matches? Strip and brighten all and then use a dark color like the TWP 1503 Dark Oak. I’m just building a new knotty cedar pergola. Timber is being shipped direct from the mill. Do I need to clean it before spray applying the stain? Also i was told by the mill that ‘Olympic stain and seal’ would be fine as it’s not being trafficked underfoot? You have to prep to remove the mill glaze. I just replaced my deck planks with red cedar. I live in Oregon where we get a lot of rain but in our three months of nice weather the deck has full sun. What would be the best stain/sealer to use and can I apply it right away? We really want to use our deck as soon as possible since our nice weather time is so limited. Try the Timber Oil Brand if you want to stain right away. First of all, you’re awesome for running this site and answering everyone’s questions. I just replaced my deck planks with yellow cedar and I bought some stain at Lowe’s, Olympic Elite Stain and Sealer. After reading this site, I get the impression that choosing a good stain is important. Should I bail on this stain? The problem is that we sampled a bunch and really liked the color of this. Buying online seems risky because we can’t sample first. Bottom line is that we want to do a fairly dark stain and do it right the first time. Thought? Thanks man! Not just a sealer. Just one coat for new wood. Just now replacing 450 ft^2 of decking with cedar. Deck is on the south side of the house in direct sunlight. 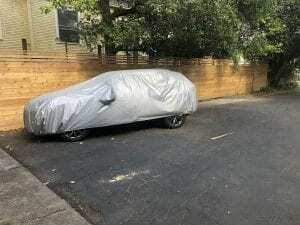 What is a good UV resistant stain / sealer and how long should I wait to apply? Wait a few months and use Armstrong Clark. Try Armstrong Clark wood stains. A little confused. This article says “Unlike some types of wood that need to dry out, new cedar should be cleaned and stained as quickly as possible to avoid water damage and sun fading”. Replays to questions posted on this article and elsewhere on this site indicate that you must wait for the wood to weather, clean, brighten and then stain. Which is it, wait to weather or stain as quickly as possible as the article says? Greg, it really depends on the stain brand you choose. Did you pick one? I have not. Would like to stain sooner vs later, what would you recommend? And what would the wait time be? Try Armstrong Clark. Wait a month, prep to remove the mill glaze, apply one light coat of the AC stain when staining the first time. Our screen porch floor deck is 30 years old and in good shape. We want to sand off old floor polyurethane and stain the cedar floor. We live in Massachusetts and deck is north facing, so mostly shade with minimal sun from sky lights. Some water from storms and winter snows, but that has not damage floor over the years. Try Restore A Deck Wood Stain or TWP 1500 Series. Hello and thank you for your information. 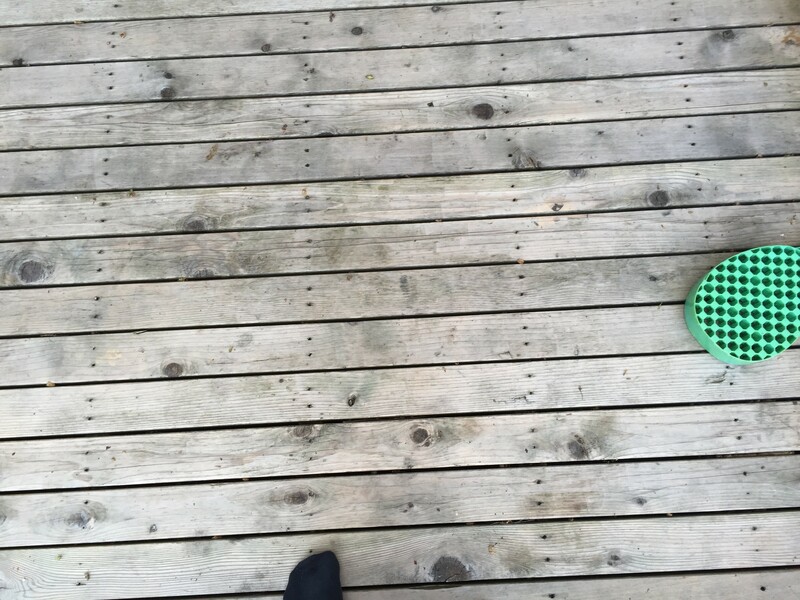 My question is about a deck that is years old, the stain that was applied by a contractor is sticky, so I cleaned it and scrubbed it with vinegar and soap and it looks great, but it isn’t new, what stain would you recommend, I understand I’m short on time, it was cleaned Monday of this week, I live in Washington so the weather here should be considered as well when selecting a sealer. Ddi you remove all of the old sealer? It does need to come off fully. Stain with Armstrong Clark or Restore A Deck Wood stains. Neither Armstrong Clark nor Woodrich are available to purchase anywhere but online, it seems – am I missing something? Why are they so hard to find? Best to contact the manufacturers for local distribution or to buy online. Just a little addt’l info: the 5.5″ cedar boards have already shrunk about 1/16-1/8″ , and their moisture is reading mostly in the 6-10% range, sometimes going to 12% here and there. Other products considered are Penofin and Cabot’s Timber Oil . Also I’m in Calif, so if I were to use TWP, It would have the be the 1500 line. And one last thing, I’ve been really trying to figure out if I want to soak the bottom, ground contact board with something like Green’s Clear Wood Preservative , which has 1% copper quinolinolate. , Advisable? Does it really do anything? They do have their green and brown versions, but I’m trying to keep the look as natural as possible . Look at Armstrong Clark or the TWP 1500, just one coat. Yes, you need to clean and brighten for the prep to remove the mill glaze. No need for the “Greens” product plus it could have issues with the stain. Up to you if you want to do both sides. Most people do. each side will run me $1250 materials and labor. Those are pretty good rates around here. What happens if I just do one side, down the road I mean? You will have bleed through of the stain on the opposite side and it will look unslightly. Best to do both at the same time to avoid this. also— is one coat in fact good enough? and you’re ok with not waiting 2-4 months before application of TWP so long as I clean and brighten first? is that correct? 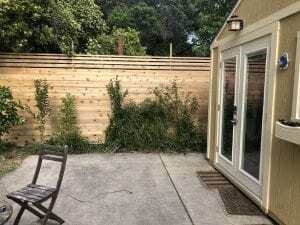 and finally, do you have a preferred method of application for this smooth, brand new, cedar fence ? Just one coat for new wood. No, the new smooth wood must weather 4-12 months and then clean and brighten for the prep if using the TWP or any other brand. Use a stain pad or brush. Whats the harm in not waiting 4-12 months?! It will soak in correctly and fail. forgot to mention the wood is kiln dried, and I’ve measured the moisture content, and it comes in at 6-10%. does that impact your guidance at all? I have a single cedar post installed end of Oct 2017. It is in it’s raw, untreated state. What should I do first? Lightly sand, use a wood oil or “conditioner”, then stain? Or, do I just use an oil based semi-transparent stain? It seems dry…I want a natural look that shows all the grain. Suggestions as to best product for this project? Try Armstrong Clark in Natural or Restore-A-Deck Wood stain in Natural. If rough sawn wood you can stain now if clean. If smooth wood, you should clean and brighten for the prep. I just bought a cedar gazebo. I’m thinking I should stain it prior to putting it together (its a kit). Is that a good approach, or should I assemble it first, let it weather, then stain it? Let weather, prep and stain. No. Will do nothing to keep the color as it will have zero UV protection. Does not preserve the wood either. In one article I read to let new decking weather for 1-12 months before applying stain. 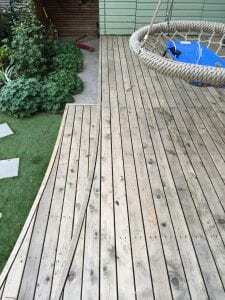 In another article I read it is best to stain new cedar decking right away. In an answer to a question from the second article, I read it is still best to let cedar wood weather at least 2-3 months. We just purchased new cedar decking. It is October in Wisconsin, snow is coming and we want to make sure we do the right thing. We would prefer to use a paraffin based stain as advised in your articles to bring out the beauty of the wood. I am sure I just misunderstood the articles and would really appreciate it if you could help me. Should we let our cedar weather over the winter then clean, brighten and stain in the spring or summer of 2018, or should we stain the cedar now before the snow comes? We are interested to use Armstrong Clark, TWP, or other premium stain. Thanks so much for your help and have a great day. Always best to follow the directions of the stain brand you choose. AC says to wait about 3 months and prep first. TWP say 4-12 months and prep first. This is for all wood types. Is there a stain that can be applied with a sprayer vs. brushing? We have a new cedar pergola. Brushing would be very time consuming. Hoping that stains can be applied with a sprayer. You can spray but you will need to back wipe drips, etc. Try the Timber Oil Brand by Woodrich. I’ve got an approximately 10yr old cedar deck that was stained a hideous reddish orange solid by the contractor who flipped the house. We just spent the last 3 days stripping, sanding with a drum, then using a hand grinder with a 60 grit, then 80, then 120. The wood is as bare as we can get it on the horizontal boards. Can we now use a semi transparent stain? We will likely use a different solid on the pickets for a two tone, as it would be horrific to sand the solid stain off those! Should be good to go with the two toned deck. I have a 13-year-old cedar front porch. I just sanded the previous layers off with a belt sander but I have about an inch left around all the edges where the sander couldn’t reach. Should I use a chemical stripper to take this off before I put down fresh stain (or sand it by hand)? Any brand recommendations? Thanks! Curious what you would use on a new yellow cedar deck? Try the Timber Oil Brand by Woodrich. I just put Messmer’s UV Plus in Oak Brown color on the bottoms of the new western red cedar deck boards. It reads orangish, but not as orange as most I’ve seen. Is there a good oil based stain that has any colors that don’t read orange-ish or yellowish? I’d like a medium or light color, not the extremely dark browns or grays. Do you think the orange tone of the Oak Brown will go away as it ages? Also, it rained a few hours after I put the stain on (on the bottoms of the boards, which I plan to turn over to screw them down with the good side up). But the rain didn’t bead on some of the boards that were fresh from the mill. Should I use an orbital sander on the good sides of those boards to prep for stain? Messmers wants new wood to weather for 8 weeks and prepped first before staining. Did you do this? Sanding is not good for prep. Reduces the ability to soak into the wood. Color fades through the years. Thank you for your reply. These boards are also kiln dried. When I spoke to someone at the Messmer’s 800 number, he told me to go ahead and stain now. However, I now have the good side of them facing up again and will leave them for as long as necessary before staining. So now I need to figure out how long to let the boards weather. In 8 weeks it will probably be raining a lot more. 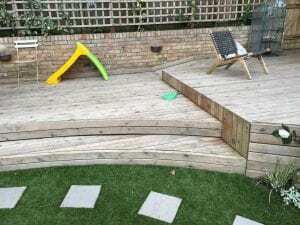 We recently installed a new cedar deck. We used Olympic Maximum clear sealer and waterproofer. The problem is we did two coats per the instructions on the container and now find out we should have done just one. Our problem is it is tacky and looks like we over applied when we didn’t. What can we do to get rid of this problem? We tried mineral spirits on a small area and it doesn’t seem to e doing anything. Strip or sand it all off is the only way to fix this. Can you stain Ceader white in color? It would have to be a solid color deck stain to be white in color. I live in WA state and just had a Alaskan yellow cedar deck installed. We would like the color to be a darker brown but don’t want to use paint/stain. All of the semi-transparent stains we have sampled don’t show or look cheap. We have tried cobat and behr. I have seen that Armstrong Clark is better for cedar, is this true for yellow cedar also? Will the stain actually show? Yes it is better and the wood grain will show through. Look at Rustic Brown color. We winstalled a new yellow cedar deck last May in Vermont. Likewise, we want a deep dark brown stain to look cohesive with our interior dark wood floors. I painstakingly did everything I was told. Washed the mill glaze off, lightly sanded and stained immediately (no need to aclimate or curewood/better penatration of stain (?)). Well, the stain sat on the deck and never penatrated. This is after one winter,. I am very bummed because we replaced the entie deck so we didnt have to scrap old stain off the mahogany deck which did have some rot. We were told this was the BEST lumber for our project. I researched for hours and ended up using Super Deck stain as recommended by our local paint shop. HELP!! The look I am trying to be cohesive with is in the third photo. Strip and brighten for the prep with Restore A Deck Stripper Kit. 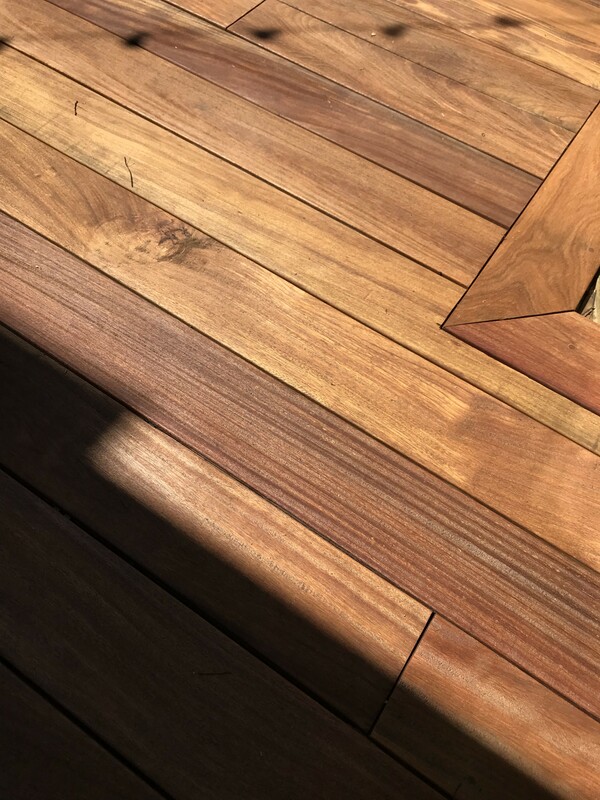 Stain with TWP 1503 Dark Oak or Restore A Deck Stain in Dark Walnut. No not really possible to spot fix. Might need to strip and start over. Armstrong Clark or the TWP stains. In the article above it is stated that I should stain the cedar deck as soon as possible but in the other article on this website and per manufacturer’s (Armstrong Clark) recommendations it should be stained 2-3 months from installation. Which one is it? Am I expecting to see any damage for waiting 2-3 months? Always best to follow directions of the manufacturer as they know their stain best. There will be no damage waiting and the prep will remove any dirt or oxidation that occurs. Sorry but we do not live there and it seems most Canadians are having a hard time finding a decent stain in local stores since the VOC laws changed there. Did you get any replies. …? Pretty much in the same boat. ..had an upper level deck where i used rough cut cedar 2 x 10 as the joists untreated. ..covered it with PT 2×6’s spruce and applied a solid stain. No longer any stain on the PT…but it sure hung in on the untreated cedar perimeter boards that I had covered as well. Big mistake I had made was to think that gapping the spruce. .. so that rain would run down on to the metal soffit that I had applied to the bottom of the joists and pitched for runoff. ..would keep it dry and give me a spot to BBQ out of the weather. 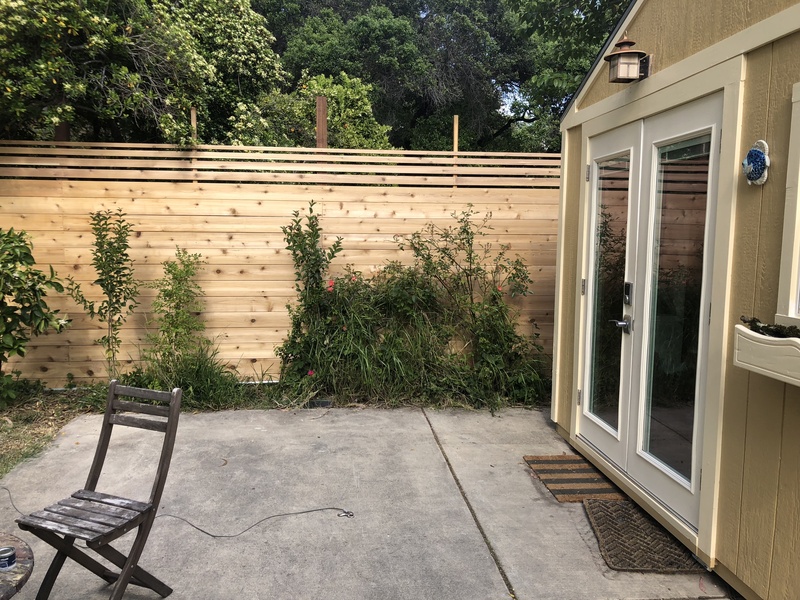 The spacing allowed all the “crap from the surrounding cedar and hardwood trees ” to land on the deck…work it’s way down to the metal soffit and stay there. ..up against the bottom of the joists. Have since removed all the soffit. ..exposed the now stained cedar (greying) joists. … it’still still easier to clean the Trex lower deck with a hose than to face rotting wood joists in the future. Let me know if you come up with a few ideas. 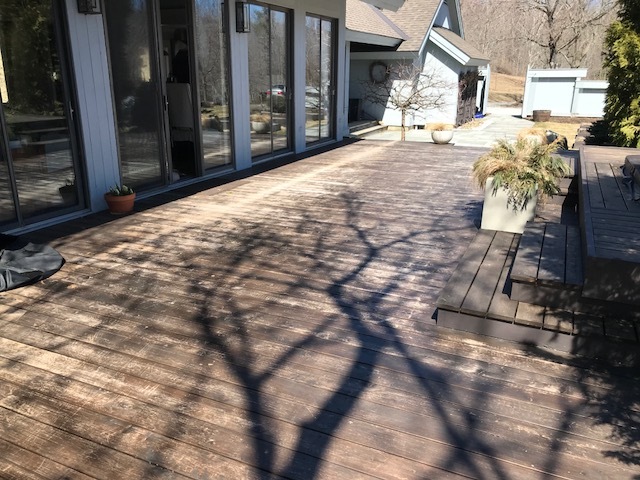 what is the best semi transparent deck stain for a new cedar deck? Try the Armstrong Clark or Defy Extreme stains.